The environment is prone to suffer pollution and toxic insult from generations of nanomaterials as well from accidental releases during production, transportation, and disposal operations. The NMs could interact with and cause adverse biological effects at cellular, subcellular, and molecular levels. Assessing potential environmental/ecological risks requires quality information on transport and fate of nanoparticles in the environment, exposures and vulnerabilities of organisms to the nanomaterials and standard methods for assessing toxicity for aquatic or terrestrial organisms and human health. The systematic risk characterization and evaluation of the safety of nanomaterials require a multidisciplinary approach and convergence of knowledge and efforts from researchers and experts from toxicology, biotechnology, materials science, chemistry, physics, engineering, and other branches of life sciences. Although studies are beginning to appear in the literature addressing the toxicity of various nanomaterials and their potential for exposure, at this stage definitive statements regarding the impacts of nanomaterials on human health and the environment remain sketchy requiring an increased level of precautions with regard to nanomaterials, as has happened with other emerging contaminants and technologies (e.g., biotechnology). The need for an increased level of understanding the perception of risk and of benefits will vary and is likely to influence public, regulatory, and non-governmental activities regarding risk and benefit evaluations. Systematic identification and assessment of the risks posed by any new technology are essential. A prudent, integrated, and holistic approach is required to develop best practices based on the scientific understanding about what we know and what we don’t know but need to know. 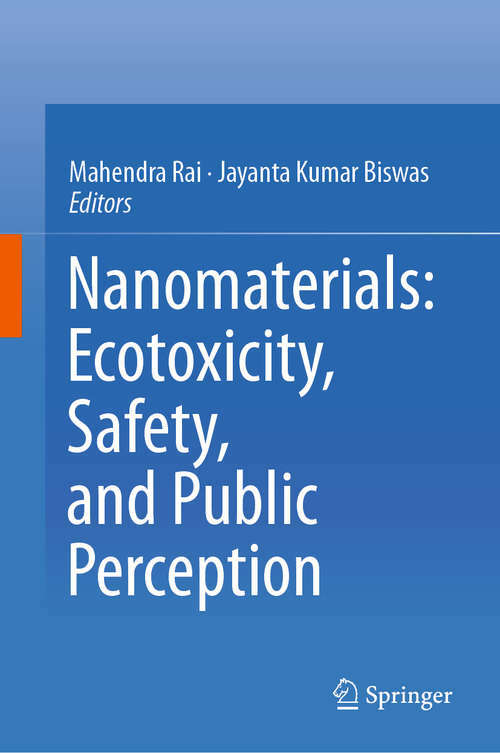 Nanomaterials addresses key issues of ecotoxicological actions and effects of nanomaterials on life and environment, their threats, vulnerability, risks, and public perception. The readers learn to read bad news objectively and think about and search for ecological ‘green’ solutions to current environmental and ecological problems with blue, grey, brown, and red shades for building a sustainable ecosystem. It shows how this molecular terrain is a common ground for interdisciplinary research and education that will be an essential component of science, engineering and technology in the future. The book is divided into three sections. Section I includes general topics related to ecotoxicity of nanomaterials to microbes, plants, human and environment. Section 2 incorporates risks generated by the use of nanomaterials. Section 3 discusss safety issues and the public.